It remains to be seen how much of the "real" Stephen Colbert we'll see when the 51-year-old comic makes his debut Tuesday night as host of The Late Show on CBS. But here are five lesser-known facts the famously in-character comic has revealed about his life and career. Despite all the interviews, airtime and magazine covers, the "real" Stephen Colbert has remained elusive for years. Even during his early days on The Daily Show, Colbert's faux news segments were often delivered through a character similar to the ill-informed, narcissistic blowhard he inhabited for nine years as the frontman of The Colbert Report. Colbert grew up in Charleston, S.C., the youngest of 11 children. But the family was struck by tragedy when his father and two brothers were killed in a 1974 plane crash. Colbert was 10 at the time, and his other siblings had already grown up and moved away, leaving just him and his mom. He was traumatized by the loss and withdrew into books. Colbert barely graduated high school, and, as he recently told GQ, later found his way into improv theatre where one director advised young comics to "learn to love the bomb." That is, embrace one's failures and disasters. "Boy, did I have a bomb when I was 10," he told GQ. "That was quite an explosion. "That might be why you don't see me as someone angry and working out my demons onstage. It's that I love the thing that I most wish had not happened." All that reading turned Colbert into a huge fan of science-fiction and fantasy — most notably the works of J.R.R. Tolkien. Colbert knows hobbits and dragons like most people know their phone number. He is reportedly fluent in Quenya, a fictional language spoken by Tolkien's elves. He and actor James Franco, a fellow fan, have thrown down on Tolkien trivia twice on air (Franco lost by a mile, both times) and in 2013 Colbert put an insanely esoteric question to director Peter Jackson during a live video chat in advance of the second Hobbit movie, in which Colbert made a cameo appearance. About the same time he was picking up Quenya, Colbert was also working to drop the southern drawl of his home state. He has said he learned at a young age, from watching TV, that southern accents were often taken as a sign of stupidity. "And that's not true. Southern people are not stupid. But I didn't want to seem stupid. I wanted to seem smart," he told 60 Minutes in 2006. So the fake newsman-to-be retaught himself to speak — by imitating TV newsmen. Keen observers will note that Colbert's right ear sticks out at an odd angle. He's been deaf in that one since he was a child, when surgery meant to fix a perforated eardrum caused damage to his inner ear. 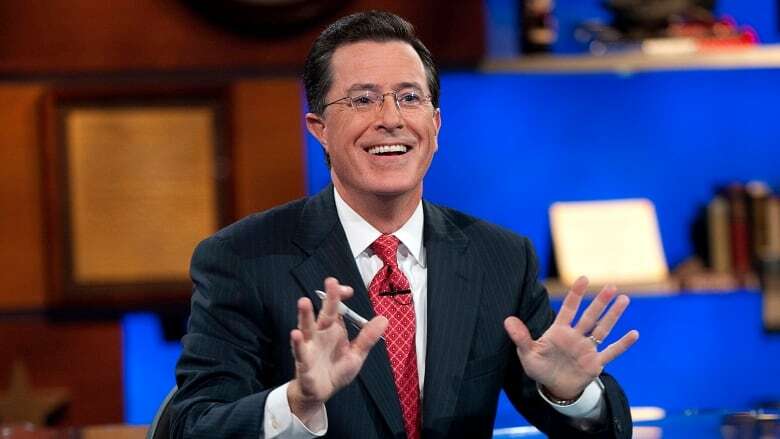 "I had this weird tumour as a kid," Colbert told The New Yorkerin 2005, "and they scooped it out with a melon baller." The condition diverted him from an early interest in marine biology because he's unable to scuba dive. But, as he demonstrated during an interview with his Late Show predecessor David Letterman, he can now tuck that ear inside itself, and pop it free at will. Colbert is a deeply devout Roman Catholic and continued to teach Sunday school, schedule permitting, at his parish in New Jersey during his rise to fame on The Colbert Report. It remains to be seen if his duties at The Late Show will leave much time for catechism with schoolkids. But Colbert's faith has remained evident throughout his career — whether in the humourous "This Week in God" segments he used to do on The Daily Show or when he dropped dead-serious scripture ("Whatsoever you do...") into his testimony to a U.S. congressional committee on migrant workers. He credited his mother for her religious insight in a 2012 interview with the New York Times Magazine. "She taught me to be grateful for my life regardless of what that entailed, and that's directly related to the image of Christ on the cross and the example of sacrifice that he gave us," he said. Stephen Colbert hosts Only in Monroe cable show, interviews rapper Eminem in Monroe, Mich.